The advantage to making money online is that the connected world gives you leverage. It enables you to create something once and earn money from it many times over. Paid surveys provide zero leverage. For every survey you do, you only get paid once... and even then, it's not very much. I’m not sure about you, but I prefer to earn passive income. I’ve seen surveys on Survey Junkie pay as low as 10 cents and as high as $3 or $4. Unfortunately, the higher paying surveys are far and few between, and you still have to qualify for them. Having said that… it’s better than many other survey sites. Surveys average between a couple minutes to take, up to half-an-hour… depending on how thorough you are when answering. Be careful though, they’ll ask you repetitive questions and try to trip you up to make sure you’re being honest and paying attention. Similar to sites like MyPoints, Global Test Market, and Opinion Outpost… Survey Junkie has its own points “currency”. 1000 points is equal to $10. One of the things I like about Survey Junkie is that they don’t hold you hostage with a ridiculous minimum that you must reach before cashing out. Vindale Research for example has a $50 minimum which also expires. All you need here for redemption is 1000 points ($10)… and you’re already at 75 (points) just for signing up and completing your profile. You are required to verify your identity when cashing out, and points can be redeemed for e-Gift cards such as Amazon and Target (US only), along with PayPal and Dwolla if you prefer cash. Here is a video of a member demonstrating the redemption process. On one hand, it would be nice to have multiple ways to make money, like Swagbucks for example. On the other hand… it’s good that they stick to what they know best. They do have a refer-a-friend program if you’re interested in recommending them to others, and you can also earn up to 5 points for doing tutorials. If you’ve read this far, you’ll know that Survey Junkie is safe… but if you’re just skimming, I'll touch on this topic because it doesn't matter what make-money-online site you're on... someone will accuse them of being a scam. One of the most common issues with online surveys is the one shown above… and with just about every online money-making site you’ll get people calling them a scam. The big issue here is that you complete surveys, accumulate points, and then get kicked out before getting paid, or have your account suspended for some mysterious reason. Usually it’s an error, or the survey taker was too quick and provided inconsistent answers. 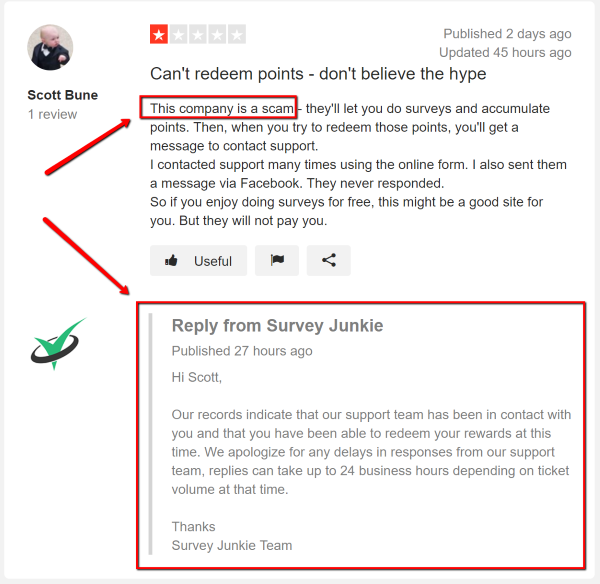 Survey Junkie responded to the complaint above, and the vast majority of reviews are positive. Currently, 88% of Trust Pilot reviewers have rated Survey Junkie either great, or excellent. There are a few Survey Junkie reviews saying “scam”, but not many. 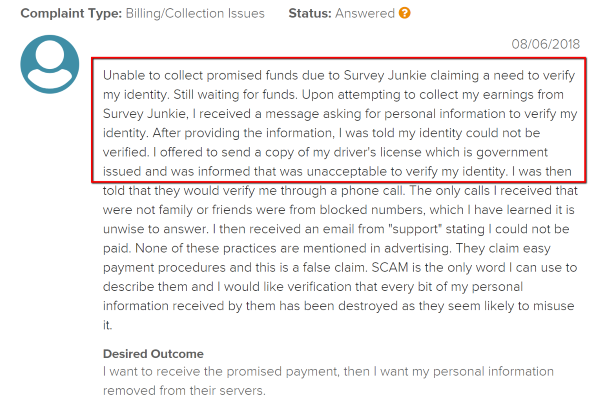 And, there are definitely real scams out there; dishonest survey sites that disqualify you and close your account so they don’t have to pay… but Survey Junkie is NOT one of them. They are legit, but that doesn’t mean they don’t get complaints. With thousands of Survey Junkie reviews on sites like Reddit and Trust Pilot, you’re going to find some problems. It should be noted though, that these complaints are common to many other survey sites as well. The surveys fill up fast and you get a message saying link expired or quota full. Getting disqualified from surveys (wrong demographic or inconsistent answers). Survey Junkie estimates that you will qualify for 1 out of 4 surveys. Low pay. Many of the surveys pay under 50 points. Difficulty when verifying identity (example below). Able to earn the minimum threshold amount in under a week and payments through PayPal are made immediately. Although not many, you do earn some points for survey attempts when you get disqualified. A lot of survey opportunities. Points are offered just for signing up and completing your profile. Better Business Bureau accredited with an A rating. Take surveys on any device. Survey Junkie is one of the most popular survey sites out there, so surveys fill up fast… usually within 24 – 48 hours. Not enough good paying surveys. I'm not a big fan of doing surveys for money. 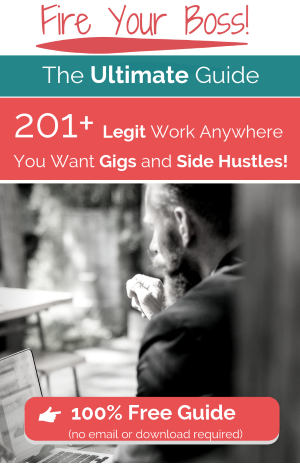 They can be time consuming, the pay is low, and you’re not building an income producing asset for the future. In my opinion, it’s better to spend your time online creating something that will provide a long-term income. 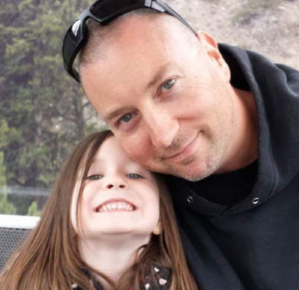 But... if you've struggled to make money online, surveys can be a fun way to get started. They’re simple and safe, and even though they don't provide passive income... if you only need a few extra bucks for coffee every now and then, Survey Junkie is a good choice. Thanks for stopping by and I hope my review was helpful. Survey Junkie has gone off the rails. You seldom get disqualified from a survey until you are at least ten minutes into it. After attempting every day for a month the closest I cam was a survey I spent 25 minutes on. The survey said I was finished but then I still got the notice that the survey was filled and I received three points. If you contact them through the help link they just send you a standard reply. Hi Hugh, thanks for the insight. We continue to hear good things about Survey Junkie (aside from the issues that plague all online surveys) but will keep an eye out for changes. If by chance you have any recommendations or experience with other sites you can share it would be helpful as well.